...Reminds us of YESTER YEAR! Introducing the VERMONT CAST IRON WOOD PELLET STOVE as we are selling it with a BLACK Door but we have available as an Option a GOLD or NICKEL Door. Colors it comes in are GOLD, Brushed NICKEL, or Matte BLACK. You are bidding on a BLACK Door but the add-on Options GOLD or NICKEL are $200 more. All Add-on Options (if there is a charge) will be paid by a special Ebay buy-it-now separate to this sale. This is the classical victorian design of the Early American Vermont Stove. The frame is made of cast iron, cast iron door, cast iron legs. Inside the stove is a modernistic design with high technology design for burning wood pellets. It boasts 42,000 BTU/Hr and will heat between 1500 and 2000 Square feet with a 50 lb Hopper Bin. It has POWER-OUTAGE capability, an add-on feature not offered elsewhere. It is still wise to buy one now and get it installed this summer so you don't miss any cold fall months. Every month you delay a decision you are losing $250 to $450 per month in heating bill savings. This is a Wood Pellet Stove and if your worried about the increase in corn prices...don't...just switch to wood pellets. This stove will burn wood pellets or anytype of bio-mass material that is pelletized. The manufacturer's recommended selling price MRSP is $2,595 Black Door and $2,795 Gold or Brushed Nickel Door. Supplies are limited and there are only a few left in the warehouse for this heating season. This item is NEW in the CRATE. Hearth Products could not have made a better stove; best stove made in America. It is No 1 Rated by Consumers Magazine. Max Speed at 42,000 BTU/Hr; Low Speed at 8,200 BTU/Hr; Heats 1500-2000 Square Feet, 50 lb Hopper Bin, burns premium Wood Pellets; Automatic ignition, Digital Touch Key-pad with Diagnostic Capability, four (4) Heat Range Settings; Low Speed Setting; Thermostat Controlled multiple modes, Power Vented, Exhaust Blower for Negative Draft, No Smoke Spillage, Combustion Chamber Brick Panels included; Four (4) Options Available as Add-ons (see Options); Limited 5 Year Warranty; EPA Exempt. Built-in Computer Diagnostic Procedure easy to follow. Easy Ash Deposit and Removal. Note: We have a MULTI-FUEL Stove that is very sophisticated will burn Corn and is Multi-fuel burning any kind of Bio-Mass material for another $200 (unless on-sale). It is also in our Ebay Store. A POWER OUTAGE Module 1000 WATTS is availble for $179. Note: the following items pictured are not included in this sale but are available for purchase separately: Flue Exhaust Kit, Fresh Air Kit, Fresh Air Damper. At a low particle emission rate of 2.19 grams/hr this unit meets or exceeds the EPA Certified Phase II Emissions Standards at 7.5 grams/hr for non-catalytic wood stoves and 4.1 grams/hr for catalytic wood stoves. Wood pellet stoves are non-catalytic. It also meets or exceeds the strict CALIFORNIA Standards, COLORADO Phase III Approved, state of WASHINGTON Standards (less than 4.5 g/hr. ), and the strict OREGON Standards (less than 2.5 g/hr) for particle emissions. Any OPTION Add-ons will be paid in a separate Ebay buy-it-now transaction. The Options are: (1) Door Matte BLACK is standard, (2) GOLD or NICKEL Door add $200, (3) Ceramic Log Set add $150, (4) Thermostat Remote Control add $225, (5) Ceramic Brick Wall Liner add $145, (6) Flue Exhaust Kit add $365, (7) Fresh air Kit add $145, (8) High Temperature Caulk add $9.50, (9) POWER OUTAGE Module 1000 WATTS is available for $179. Again to repeat, any OPTION Add-ons will be paid in a separate Ebay buy-it-now transaction. You must have AUTO-Ignite to use this feature. It is possible to either run this Fireplace Insert with either a Thermostat or without one. The switch at the top of the digital display has either AUTO Mode, HIGH/LOW Mode, or Manual Mode. In AUTO Mode, the thermostat will turn the insert(stove) on by electric igniter. In HIGH/LOW Mode, the thermostat will set from the factory low setting to your desired Heat Select setting. If you run in thermostatic mode, it is recommended you run in HIGH/LOW Mode. The thermostat hooks up to two terminals in the rear of the printed circut board. We sell either a Wall Digital (Round or Square) Thermostat, or a Wall Dial-Indicator Thermostat, or a Remote (Portable) Thermostat. WORRIED ABOUT CORN PRICES RISING? Worried about Corn Prices rising...well don't worry...just buy wood pellets. Its as simple as that. The demand for wood pellet stoves has gone up as people are switching to wood pellets because of Corn price increases ($6.75 to $9.95 per 50 lb bag) due to Ethanol demand. The price of wood pellets at $4.50 per 40 lb bag is expected to increase this winter to $5.50 per 40 lb bag ... but it is still less than corn. The costs to operate a stove will be 1/3th to 1/4th natural gas, propane gas, and fuel oil.. $5.50 per Bag will heat a 1500 square foot home one day or and average of $165.00 per month. That beats a $500.00/month Natural Gas bill by a long shot! WOOD PELLET STOVE, Econo Saver Pellet Stove, smaller in size and fits in tight spaces, 45 lb Hopper Bin, 40,000 BTU/Hr., from 1500 to 2000 Sq.Ft. WOOD PELLET STOVE, Beauty-Bay Window, 45-50,000 BTU/Hr., Heats up to 2000 Sq.Ft. WOOD PELLET STOVE, Jumbo World's Largest Pellet Stove, 300 lb, 55,000 BTU/Hr., to 2000 Sq.Ft. STOVE MULTI-FUEL, High Tech Saver, 52,500 BTU/Hr., Multi-fuel Capabilty, burns corn, wood pellets, grain, etc., Heats up from 1500 to 2500 Sq.Ft. 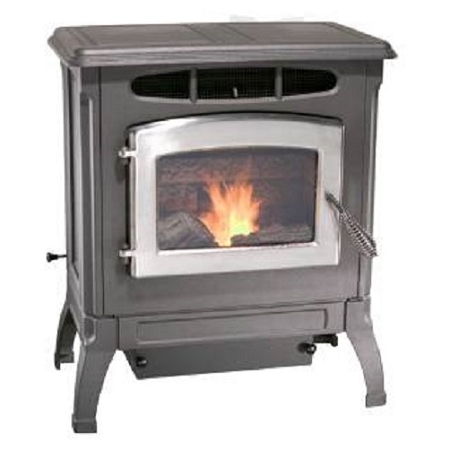 STOVE CORN/PELLET, BAY WINDOW, 50,000 BTU/Hr., Multi-fuel, Heats up to 2500 Sq.Ft. There is a LIMITED LIFETIME WARRANTY with 5 Years on the heat exchanger, frame housing, door, fire pot, auger, agitator, and a 1 YEAR WARRANTY on the glass and electronics. With the purchase you get an Operator's Manual, a parts list, a parts diagram, and a toll-free number to call for questions in case we can't answer them. Be careful from whom you buy. We are a Dealer specializing in wood pellet and corn stoves and can help you through the installation as well as any on-going trouble shooting if necessary. Be careful as others may not have the capability to do that. For customers with forced-air ducting furnaces, we some simple recommendations on how you can revise your existing duckwork to improve the performance of this free standing 2009 Model. However, if you want to spend more money, then we have another furnace specically designed for forced air called The Forced Air Ductor. It can be hooked up to your existing ductwork. It is listed as Forced-Air Corn Furnace and we have one that just arrived and it is found in our Ebay Stove: . It is more expensive, spend more and get more. Grab it as it just arrived! Contact us by phone or E-mail for additional comments. There are two alternatives for Fresh Air: (1)Use the Fresh Air Kit that draws air from the outside, (2)Use the Room Air and control it with the supplied mechanical damper. Tightly sealed new homes need a fresh air kit to avoid room air vacuum. Older homes with air-leaky windows and doors can use either one. We still recommend a fresh air kit for older homes because: (1)control your air flow better, (2)stoves like oxygen-rich outside air versus stale impure inside air, (3) your room air blower is only 12 inches away from you combustion air inlet and it alone could steal (starve) air from the combustion process, (4) other house fans such as bathroom fans, kitchen hood fans, attic fans may starve the stove of combustion air creating a negative pressure, (5) aerosol spay cans can put imputities into the air in the kitchen and bathrooms. Customer may pick this item up in person or have it shipped by a commercial freight carrier 400 lbs to the nearest large-city Main Terminal serving the customer's geographic area and the Customer will pickup the item at this large-city Main Terminal. We estimate Freight to range between $185.00 to $305.00 and we will charge an average flat rate of $245.00 for the U.S. mainland.